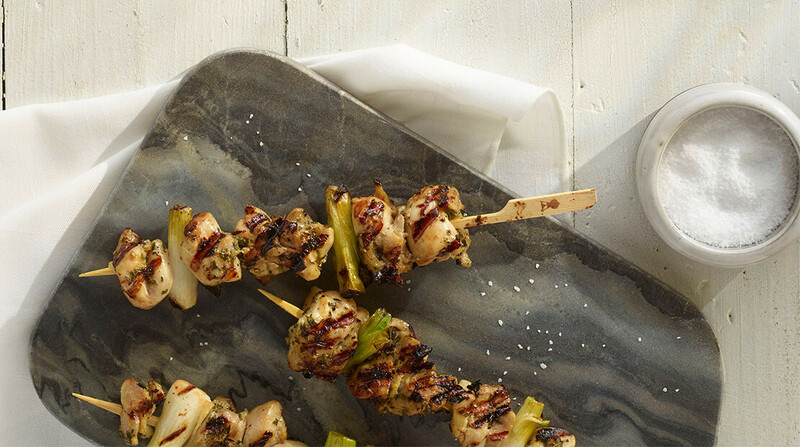 Kabobs are a go-to summer meal across the United States. Easy to customize and diversify, these combinations of meat and veggies are sure to delight. Before the grill goes back in storage for the season, try out a few summer favorites. In small saucepan, bring chili sauce and next 4 ingredients to a boil. Reduce heat and simmer 5 minutes or until thickened. Let stand 5 minutes. Thread ham, pineapple, red bell pepper and jalapeños on soaked wooden or metal skewers. Brush grill with oil. Heat grill to 350°F. 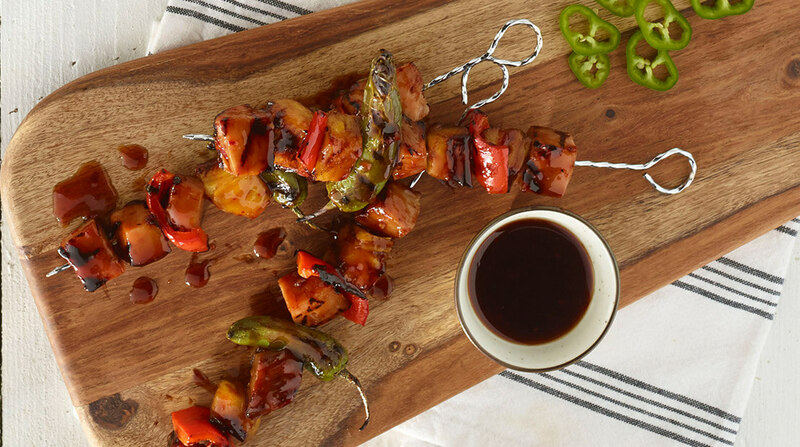 Grill kabobs 2 to 3 minutes per side or until vegetables are tender, brushing frequently with sauce. In small bowl, combine chili sauce and next 3 ingredients. 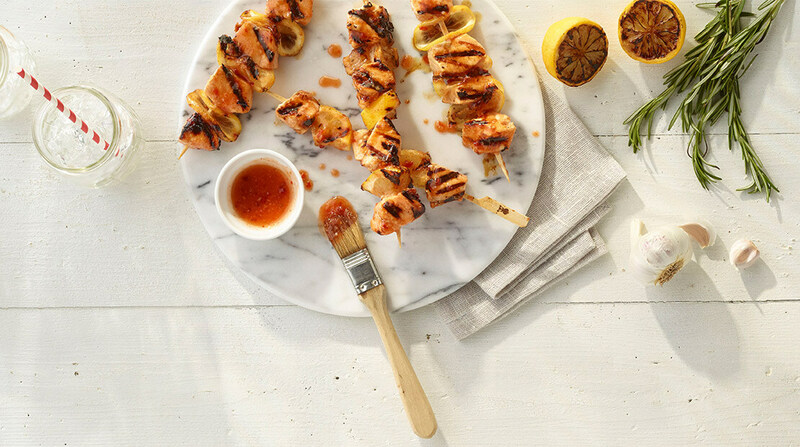 Thread salmon and lemon slices on soaked wooden or metal skewers. Brush grill with oil. Heat grill to 400°F. Grill kabobs 3 to 5 minutes per side or until desired degree of doneness, brushing frequently with glaze. In large bowl, combine first 6 ingredients. Reserve ¼ cup mixture for glaze. Add pork to bowl, cover and refrigerate pork and reserved glaze 4 hours or up to overnight. Brush grill with oil. Heat grill to 350°F. Remove pork from marinade, discarding marinade. 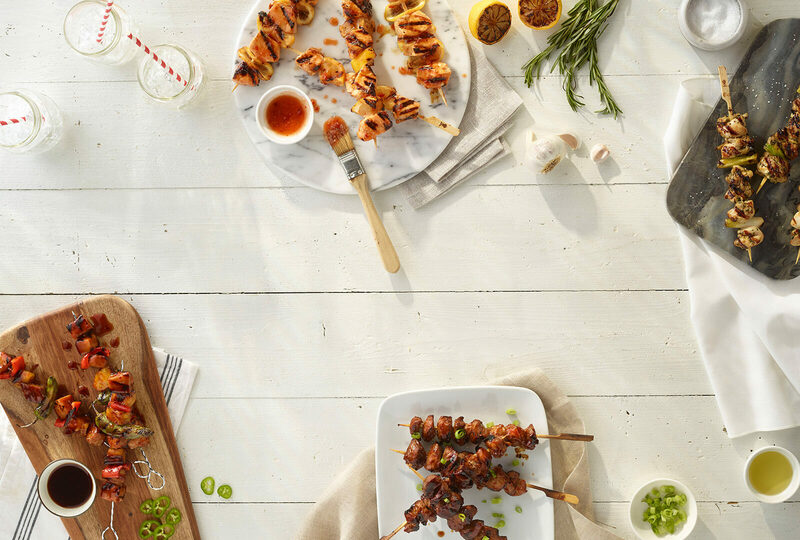 Thread pork cubes on soaked wooden or metal skewers. Grill 7 to 10 minutes per side, turning often, until pork is tender. Brush with reserved glaze mixture. In large bowl, combine chicken and remaining ingredients. Cover and refrigerate 1 hour or up to 4 hours. Remove from marinade, discarding marinade. 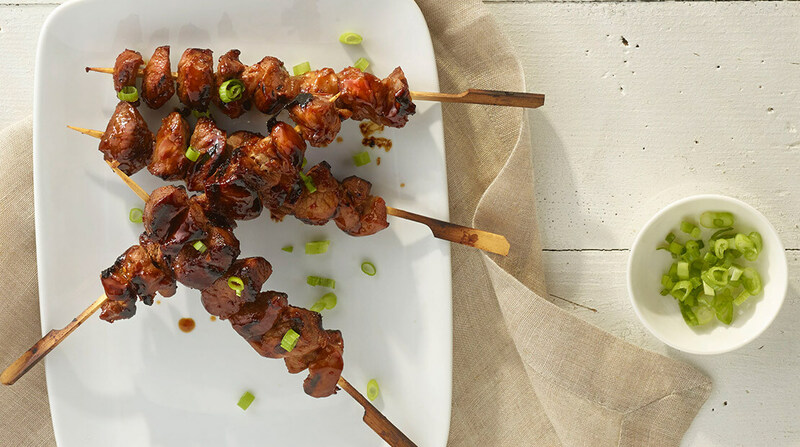 Place chicken and green onion on soaked wooden or metal skewers. Brush grill with oil. Heat grill to 350°F. Grill kabobs 3 to 5 minutes per side or until chicken is cooked through.